Fran (Greg and Annie) [wmv] Compare to 8/23/11. sub Beginner Pull ups, Assisted Pull ups or Ring Rows as necessary. Scaled WOD courtesy of BrandX. pack 65# 7:05 a PR - last time I ran this was 8/23/2011 when I was old and bald. I'm older and still bald but fitter thanks to carport. Verrrry proud of Cori and Amber for an excellent showing in West Palm and it's great to have you all back! And great support by Dave and Drew! No! Not the F word!!!! Anna G where you at? Anna P had to singularly bear the Anna burden all by herself this A.M. A one Anna day is good but a two Anna day will always be great! Maybe you misread the WOD...there were no burps today. Woo! I haven't done Fran in FOREVER! I'm excited! 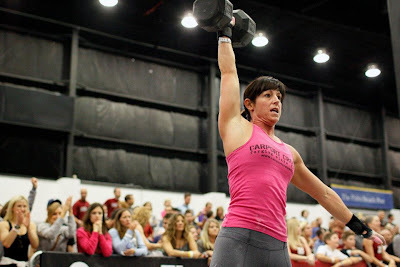 Fran-10:25 Started at 45lbs had to change weights to 35lbs during first set. Working towards that first unassisted pullup! Hate I missed y'all this morning! I'll be there Thursday. 9:59 with 35# and ring rows. 75# in 5:45. Continuing to work on kipping. 4:08, 45# to box, JPU-Cynthia, 7 DUs in a row! Sub 6 min. Great job Paul! Thanks to CrossFit New England. Awesome Video. Think CrossFit Is Too Hard?